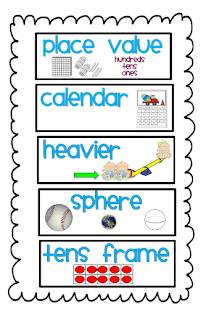 Fabulous Firsties: Math Vocabulary Cards....TaDa!!! Whew. 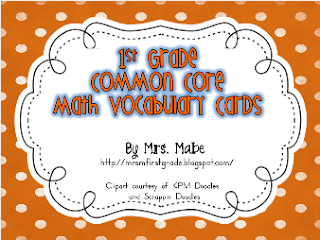 Let me just say that these math vocabulary cards have been a labor of love! I started creating/working on them LAST SUMMER (ha) and have just put the finishing touches on them. 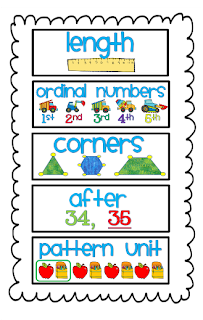 I used a majority of these cards in my room this year on my math word wall. My district has adopted Common Core standards, so I have been adding more words that align with Common Core. My district provided picture cards for us to print and use, but can we say, colorless and b-o-r-i-n-g! 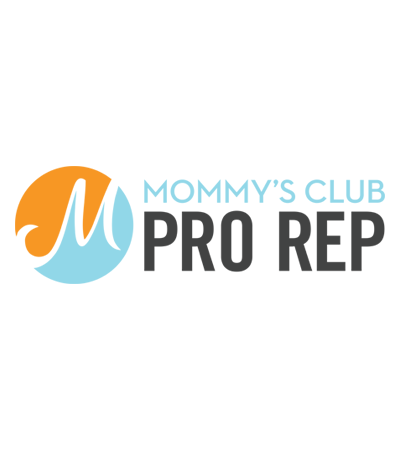 I wanted something very simple and clean, but jazzed up in fun colors and clipart. Viola! Below is a preview of the end result. 104 vocabulary cards for a quick reference in your room. Click on the images to go check them out! Tomorrow, I am venturing back into my classroom and will start taking some pics. I have moved to a nice, big room with lots of storage (YAY) and while I don't even want to think about summer ending, I do get excited thinking about decorating and setting up for a new year and new firsties!! Hi! I saw your cards on Pinterest, and I believe they are very useful! I just wanted to make you aware of one thing. 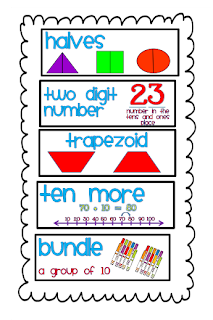 The trapezoid you have pictured is a special one. It is an isosceles trapezoid which means it has one pair of equal sides and one pair of parallel lines. However, a quadrilateral just needs one pair of parallel sides to be classified as a trapezoid, not equal sides. I know this sounds petty, but those "important" tests usually show something other than an isosceles trapezoid. It's like never showing children a triangle that is standing on its point; so they think it can't be a triangle.